Last edited by Giggs; 07-20-2018 at 12:03 PM. Official Serie A Calendar for the 2011/12 season. Last edited by samsha22; 08-29-2010 at 10:40 PM. Last edited by samsha22; 08-29-2010 at 10:41 PM. (2009–10)Most championshipsJuventus (27 titles)TV partnersSKY Italia, Mediaset Premium, Dahlia TVWebsiteLegaSerieA.it 2010–11 Serie ASerie A (Italian pronunciation: [ˈsɛːrje ˈa]), currently called Serie A TIM due to sponsorship by Telecom Italia Mobile, is a professional league competition for football clubs located at the top echelon of the Italian football league system and has been operating for over eighty years since 1929. It had been organized by Lega Calcio until 2010, but a new league, the Lega Serie A, has been created for the 2010-11 season. It is regarded as one of the most elite leagues of the footballing world. Historically, Serie A has produced the highest number of European Cup finalists and the most victories in the competition, such as Spanish clubs. In total Italian clubs have reached the final of the competition on a record twenty-six different occasions, winning the title twelve times. Currently, Serie A is ranked 4th among European leagues according to UEFA's league coefficient, which is based on the performance of Italian clubs in the Champions League and the UEFA Europa League. It also ranked 4th in world according to the first trends of the 2010 IFFHS rating.. In its current format, the Italian Football Championship was revised from having regional and interregional rounds, to just one solid league from the 1929–30 season onwards; the Serie A system carries on today. The championship titles won before 1929 are officially recognised by FIGC as a championship in the same way the ones since then are. The 1945–46 season, when the league was played over two geographical groups due to WWII destructions, is not statistically considered, even if its title is fully official. The league hosts three of the world's most famous clubs as Juventus, Milan and Internazionale, all founding members of the G-14 a group representing the largest and most prestigious European football clubs; Serie A was the only league to produce three founding members. More players have won the coveted Ballon d'Or award while playing at a Serie A club than any other league in the world. Milan is one of two clubs with the most official international titles in the world, and have won 7 European Cups, only surpassed by Real Madrid, and more than Internazionale and Juventus combined. Juventus, the most successful Italian team, is tied for third in Europe and sixth in the world in the same ranking. They are also the only club in the world to have won all official international competitions. Internazionale, following their achievements in the 2009-10 season, are the first and only Italian team to have achieved The Treble. During the course of a season, from August to May, each club played each of the other teams twice; once at home and once away, totaling 38 games for each team by the end of the season. Therefore, in Italian football a true round-robin format is used. In the first half of the season, called the andata, each team played exactly one time against each league opponent, for a total of 19 games. In the second half of the season, called the ritorno, the teams played in exactly the same order that they did in the first half of the season, the only difference being that home and away situations are switched. Since the 1994-1995 season, teams were awarded three points for a win, one point for a draw, and no points for a loss. Since Italy is currently rated as one of the top three European countries in terms of club football ratings, the top four teams in the Serie A qualified for the UEFA Champions League. The top three teams qualify directly to the group phase, while the fourth-placed team enters the competition at the third qualifying round and must win a two-legged knockout tie in order to enter the group phase. Teams finishing 5th and 6th qualify for the UEFA Europa League Tournament. A third UEFA Europa League spot is reserved for the winner of the Coppa Italia. If the Coppa Italia champion has already qualified for the major European tournament by placing in the top four of Serie A, the third UEFA Europa League spot goes to the losing finalist. If both Coppa Italia finalists finish among the top six teams in Serie A, the 7th classified team in Serie A is awarded the UEFA Europa League spot. The three lowest placed teams are relegated to Serie B. Before the 2005–06 season if two or more teams were tied in points for first place, for only one spot in a European tournament, or in the relegation zone, teams would play tie-breaking games after the season was over to determine which team would be champion, or be awarded a European tournament spot, or be saved or relegated. Since 2005–06, if two or more teams end the season with the same number of points, the ordering is determined by their head-to-head records. In case two or more teams have same total points and same head-to-head records, goal difference becomes the secondary deciding factor. In 1958, based on an idea of Umberto Agnelli, the honor of Golden Star for Sports Excellence ("Stella d’Oro al Merito Sportivo" in Italian) was introduced to recognize sides that have won multiple championships or other honours by the display of gold stars on their team crests and jerseys. However, the Golden Star is not officially awarded by the Federazione Italiana Gioco Calcio (FIGC) and is voluntarily added to team jerseys by the respective team. In Italy, the practice is to award one star for ten titles. The first team to adopt a star was Juventus in Italy and Europe, who added a star above their crest in 1958 to represent their tenth Serie A title. In 1982, they received their second golden star for having won their 20th league title. Juventus, received in 1958 and 1982. Serie A, as it is structured today, began in 1929. From 1898 to 1922 the competition was organised into regional groups. Because of ever growing teams attending regional championships, FIGC split the CCI (Italian Football Confederation) in 1921. When CCI teams rejoined the FIGC created two interregional divisions renaming Categories into Divisions and splitting FIGC sections into two North-South leagues. In 1926 due to internal crises FIGC changed internal settings adding southern teams to the national divisions which lead to 1929-30 final settlement. No title was awarded in 1927 after Torino were stripped of the championship by the Italian Football Federation (FIGC). Torino were declared champions in the 1948-49 season following a plane crash near the end of the season in which the entire team was killed. The Serie A Championship title is often referred to as the scudetto (small shield) because since the 1924-25 season the winning team will bear a small coat of arms with the Italian tricolour on their strip in the following season. 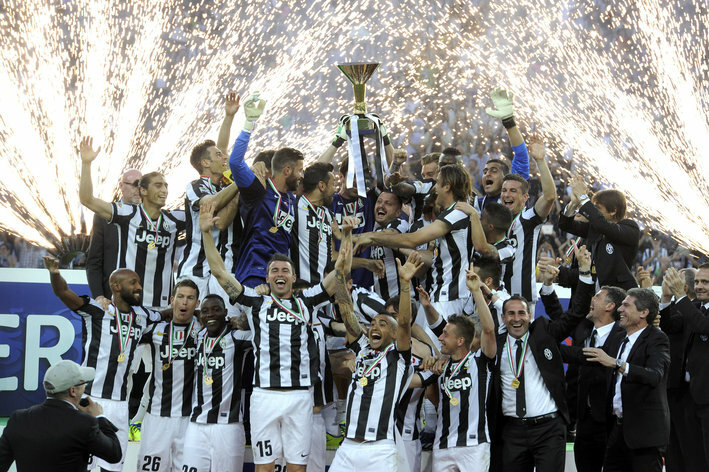 The most successful club is Juventus with 27 championships, followed by Internazionale (1 , Milan (17), and Genoa (9). From 2004-05 onwards an actual trophy was awarded to club on the field after the last turn of the championship. The trophy, called Coppa Campioni d'Italia, is official since the 1960–61 season, but between 1961 and 2004 it was consigned to the winning clubs at the head office of the Lega Nazionale Professionisti. On 30 April 2009, Serie A announced a split from Serie B. Nineteen of the twenty clubs voted in favour of the move in an argument over television rights. Relegation-threatened Lecce voted against. Maurizio Beretta, the former head of Italy's employers' association, will be the president of the new league. In countries and territories outside of Italy, the league is broadcast on Raitalia (numerous countries in several continents), Canal+ Poland (Poland), KBS Sports (South Korea), TV+ (Bulgaria), RCTI, Global TV (Indonesia), Arena Sport, Sport Klub (Serbia), Supersport Kosova (Kosovo), NTV Turkey (Turkey), Telma (Macedonia), In televizija (Montenegro), mio TV (Singapore), Telelatino, The Score and Fox Sports World Canada (Canada), Fox Soccer Channel, Fox Soccer Plus and Fox Sports en EspaÃ±ol (United States), Digi Sport (Hungary), Sport1 (The Netherlands), ESPN (UK) (United Kingdom), TV Esporte Interativo, Rede Gazeta, TV Cultura, ESPN Brasil, Sportv (Brazil) and ESPN Latin America (Latin America), TrueVisions (Thailand), Neo Sports, TEN Sports (India) , Al Jazeera Sports (Middle East And North Africa) and HiTV (Nigeria) . In Australia Serie A is broadcast by Setanta Sports Australia with up to four live games per week from the 2010-11 season. Also by Raitalia with four live games per week. Digital channel One HD also began broadcasting Serie A matches in the 2009-10 season. In the 1990s Serie A was at its most popular in the UK when it was shown on Channel 4, although it has actually appeared on more UK channels than any other league, rarely staying in one place for long since 2002. The Score Television Network holds exclusive Canadian media rights to Serie A, which also includes full digital rights for theScore.com. Coverage begins in the fall of 2010 and it will be the first time a major Canadian sports network will deliver Serie A matches in HD to sports fans all across Canada. The 1926-1927 title was initially won by Torino, but was rescinded due to the Allemandi scam. The 2004-05 and 2005-2006 titles were initially won by Juventus, but were rescinded due to the Calciopoli scam. The 2004-05 title was not assigned, while the 2005-06 title was subsequently awarded to Internazionale. A decoration was awarded to Spezia Calcio in 2002 by FIGC for the 1944 wartime championship. However, the Federation stated that it can't be considered as a scudetto. Last edited by samsha22; 09-26-2010 at 12:01 AM. Inghineyokke transfer nadathiyittum Juventus nu rakshayille , anyway it's too early. Milan getting in to form too early , I can't see Benitiez's Inter winning the Scudetto this season.